This fully revised and updated introduction to forensic biology carefully guides the reader through the science of biology in legal investigations. Full-colour throughout, including many new images, it offers an accessible overview to the essentials of the subject, providing balanced coverage of the range of organisms used as evidence in forensic investigations, such as invertebrates, vertebrates, plants and microbes. The book provides an accessible overview of the decay process and discusses the role of forensic indicators like human fluids and tissues, including bloodstain pattern analysis, hair, teeth, bones and wounds. It also examines the study of forensic biology in cases of suspicious death. This third edition of Essential Forensic Biology expands its coverage of molecular techniques throughout, offering additional material on bioterrorism and wildlife forensics. The new chapter titled ‘Wildlife Forensics’ looks at welfare legislation, CITES and the use of forensic techniques to investigate criminal activity such as wildlife trafficking and dog fighting. The use of DNA and RNA for the identification of individuals and their personal characteristics is now covered as well, along with a discussion of the ethical issues associated with the maintenance of DNA databases. 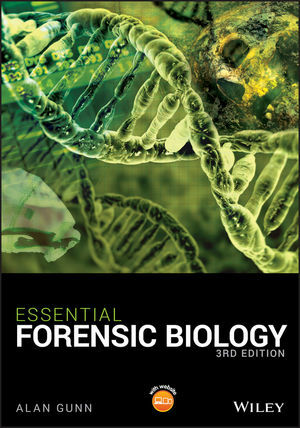 Essential Forensic Biology, Third Edition is an excellent guide for undergraduates studying forensic science and forensic biology. ALAN GUNN, PHD, is Principal Lecturer and Subject Leader for Biosciences at the School of Natural Sciences & Psychology, Liverpool John Moores University, UK.